The film critic Mark Kermode wrote in the opening of his 2015 ‘Observer’ article ‘Jaws 40 years on: One of the truly great and lasting classics of American cinema’. Anyone familiar with Kermode’s BBC Radio 5 Live film show with Simon Mayo will know that he is fond of telling listeners what he thinks Jaws is actually about, namely infidelity. The question ‘what is a story about?’’ fascinates everyone because a story has to be about something. But there is a common lament amongst people who read manuscripts, books, plays and scripts for a living: ‘It was okay, but it wasn’t about anything.’ And that is clearly a problem. To understand, you must first understand why we tell stories at all. Back in the days of yore, long before scholars set down the tales of Gilgamesh and Beowulf, the world was full of mystery and danger and the only way to make sense of the noises in the night or the lights that shot across the sky was to use your imagination. Those with the most fertile imaginations seemed to come up with the most plausible explanations: the noises in the night were monsters that would come and get you if you were bad and the lights in the sky were the creator’s anger. Over time, and through retelling, these seeds grew like any organic thing and became stories: the noises in the night became ‘Beowulf’ and the lights across the sky became ‘The Bible’. But what they never lost, in all the millennia they have been told and retold, is the germ of their inception: to make sense of the world. Whether they do it as a grand gesture – Tolstoy’s ‘War and Peace’ – or simple allegory – Orwell’s ‘Animal Farm’ – all storytellers continue to be motivated by this simple ambition. He is afraid, it is his defining characteristic, and when you look closely you realise that everyone around him is afraid of something: Hooper, the rich city boy, is afraid of not being taken seriously, the mayor is afraid of what will happen to his reputation and career if he closes the beaches, Ellen, Brody’s wife, is afraid of losing her family and the most wonderful manifestation of fear is Quint. Quint ends the monologue in which he describes watching his shipmates being eaten alive after a Japanese submarine sinks the USS Indianapolis with the statement that he’ll never put on a life jacket again: Quint is afraid of fear itself.In the first half of Jaws, Brody gives in to his fear: he remains on dry land while he gets others to hunt the shark. Halfway through, after the fishermen have caught the wrong shark and the patrol around the beach miss the shark because two boys cause a distraction, Brody realises that the only way he is going to defeat his foe is by following it into its lair – which is the thing he is most afraid of: the ocean. Once he is on the boat his fear is emphasised: he wears a life jacket and he refuses to climb out to the edge of the boat to give Hooper perspective. 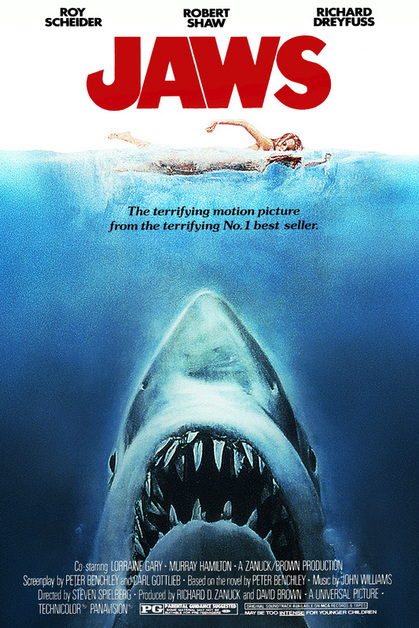 And things go from bad – ‘We’re gonna need a bigger boat.’ – to worse: Quint destroys their radio, the boat starts to sink, the engine explodes, they think they’ve lost Hooper when they pull his diving cage back up and it’s all mangled and then he has to watch Quint being eaten alive. All of which would traumatise any normal person never mind someone who was already afraid of water. And yet the experience has the complete opposite effect on Brody: instead of feeling that his fear was justified, his fear is vanquished: ‘I used to hate the water,’ he says, as he and Hooper swim back to dry land. ‘I can’t image why,’ Hooper responds.